FRONTIERADO IS COMING ON FRIDAY, AUGUST SECOND! With the Frontierado holiday almost upon us what better time to examine three more figures who helped make the American west wild? 3. LOTTIE DENO – Equally comfortable dealing faro, playing poker or shooting a pistol Charlotte “Lottie” Deno was one of the most famous female gamblers of the old west, along with Poker Alice. Lottie didn’t engage in nearly as many gunfights as Poker Alice did, but she didn’t have to, since she was very skilled at maneuvering lovesick men into doing some of her killing for her. Even her no-good husband Johnny Golden was bumped off by two of Lottie’s male conquests. Lottie, who said she learned card-playing from her father, was a former southern belle who came west after the Confederacy fell. She spent three years in San Antonio dealing faro and playing poker in, among other places, the iconic vaudeville saloon of Jack Harris, where Texas Ben Thompson and King Fisher were killed the same night in 1884. Fellow gambler Frank Thurmond began a romance with Lottie but when he proposed marriage she fled town since at that time the husband who abandoned her was not yet dead. After gambling her way through Jacksboro, San Angelo and Fort Concho, 1876 saw Lottie settle down in the tough Texas town of Fort Griffin. 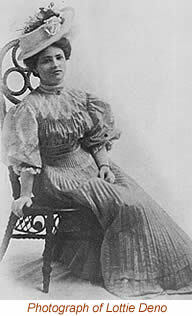 Now in the most famous period of her career Lottie, called “Lotta Dinero” because of the thousands of dollars she won at poker, is verified to have wiped out Doc Holliday himself in a card game one night. Doc was smitten with Lottie and lingered in Fort Griffin because of her, but he could never beat her at cards or charm her into returning his romantic interest. 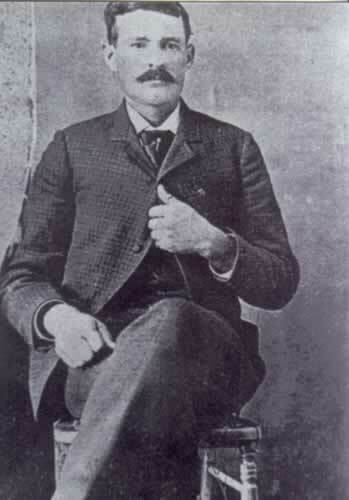 Pat Garrett, still in his buffalo hunting period, also lost to Deno during this time. After the death of Lottie’s husband Johnny her old flame Frank Thurmond came into her life again and the two left Fort Griffin together in 1878 in an elopement. Lottie Thurmond and her husband gambled and partied in Silver City, New Mexico for a few years, where on one memorable night Lottie won $9,000 in 1800’s money. In 1881 the Thurmonds moved to Deming, NM, where they invested their winnings in a home plus mining and ranching interests. Frank died of throat cancer in 1908, and Lottie never remarried, finally passing away in 1934 at age 89. The couple had no children. Lottie was the model for the fictional female gambler Faro Nell in Alfred Henry Lewis’ series of Wolfville Tales published from 1897 to 1908. 2. 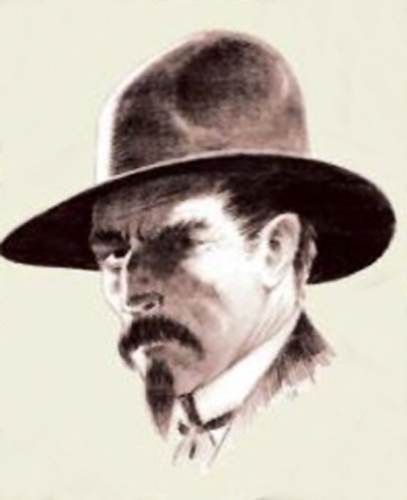 BLACK JACK KETCHUM – Black Jack was one of the leaders of the many outlaws who made their home in Hole In The Wall, Wyoming, all of them roughly lumped together under the general name the Hole In The Wall Gang. Though Butch Cassidy’s Wild Bunch faction of the gang is by far the most famous grouping, Ketchum and his followers deserve a much bigger reputation than they currently enjoy. Ketchum was born in 1866 in San Angelo, TX, and by 1887 he was working as an actual cowboy at various ranches in the Lone Star State. In 1890, after a cattle drive to Clayton, NM, Black Jack and his brother Sam were involved in a train robbery and would spend the rest of their lives as outlaws, vowing never to work as miserable cowhands ever again. By 1892 Ketchum’s Hole In The Wall gang included his brother Sam, Will “Noose” Carver, Ben Kilpatrick and Bronco Bill Walters. The Gang began alternating its time between launching train and bank robberies from their Hole In The Wall headquarters and running a shady saloon and gambling hall back in San Angelo. By 1895 Kid Curry and his brother Flatnose Curry were briefly in Black Jack’s orbit, but eventually gravitated to Butch Cassidy’s faction. That defection happened following Ketchum’s gang being forced to abandon their saloon and gambling front after Black Jack gunned down an inquisitive townsman. After the war he next surfaced in New Orleans, LA, as part of the city’s Metropolitan Police Force in 1868. By 1873 Smith had made detective and married his sweetheart Anna Mannion. Whispering Smith was often involved in shootouts with criminals all over New Orleans and was suspected of frequently acting outside the law to blow away miscreants too slippery to be caught red-handed. Grand Juries investigated Smith’s actions on a few occassions and after he was exonerated yet again in January of 1876 James and Anna decided to head further west where he hoped for a law enforcement career less encumbered by legal niceties. For years he worked as a Railroad Detective for the Union Pacific Railroad, arresting con men and tracking down train robbers in Nebraska, Wyoming and Utah. In 1879 he was reassigned to the Nebraska to Dakota Territory Line and used his guns against outlaws robbing trains and stagecoaches as well as plundering horses and supplies from Native Americans on the reservation the train passed through. As in New Orleans, Whispering Smith was occassionally suspected of involvement in vigilante justice when outlaws proved too slick to bring to trial. In 1880 Smith helped recover stolen gold bullion worth $125,000 (by 1800’s money) after a train robbery in Sidney, NE and bring the felons to justice. That saga, which included attempts to kill Whispering Smith by crooked lawmen in the pay of local outlaws, was as intricate and involved as the Clanton/ Earp war in Tombstone. In 1881 Smith left railroad work but served in various law enforcement capacities for the rest of his life. Those jobs ranged from Chief of Police on Indian Reservations to Stock Detective for cattle concerns to a clash with Bat Masterson in Denver over illegal boxing clubs. Everywhere he was followed by clouds of suspicion because of his repeated tendency to go beyond the law in bringing down his quarries. Always a heavy drinker, James became a confirmed alcoholic after the turn of the century. He enjoyed brief publicity from time to time through newspaper interviews but died penniless in 1914, committing suicide by swallowing lye. By some accounts Whispering Smith was the inspiration for Max Brand’s fictional gunslinger Whistling Dan. Lottie Deno is my new idol! Who I wouldn’t give to meet up with Lottie Deno and talk about the boys from Tombstone and Young Guns! Pat Garret was in Young Guns right? Yep, Pat Garrett was played by Patrick Wayne in Young Guns in a cameo. In Young Guns 2 he was played by William Peterson. Kid Slaughter is da bomb!